The grape growing at this vineyard began in 1946 when John Lizak planted the seeds for the fruit farm along a huge farmland. In 1990’s the winery was opened by John’s grandson Paul. 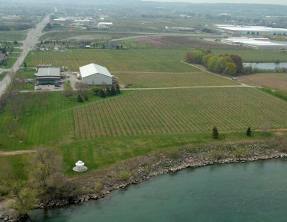 The vineyard now stretches over 200 acres and features a variety of fruits and signature grapes to create some of the best wines in the Niagara Peninsula. Priding itself on producing unique wines, Legends Estate Winery features a distinctly dry Fruit Wine Collection, an exclusive VQA award winning wine collection, and now icewines and special reserves. The main varietals of Legends Estates are the Chardonneys, Gewurztraminer, Cabernet-Franc and Meritage. The Legends wedding experience is one-of-a-kind, with ideal location at the waterfront view. The Winery is prepared to offer guests with quality wines and exceptional service to make your special occasion perfect. More intimate occasions can be held in the Polonaise Room, which holds up to 100 people. For the reception with many guests the outdoor area can fit as many as you would like. Tasting Only – Guests have the opportunity to taste a wide variety of wines produced at Legends. The Sweet Tour – The perfect mix of chocolate and award-winning wines paired together with this tour. Reservations Required. The Cheesey Tour – The great way to learn how to entertain, pairing fine cheeses with award-winning wines. Reservations Required. Legends Tour – The great tour of the winery that allows guests to take home their own glass. Reservations Required. Winemaker Tour – Learn the art of winemaking from the expert winemakers at Legends. This Tour also lets guests sample from the fermentation tanks or the barrels. Reservations Required. Martini Tour – This new tour allows guests to enjoy an Icewine or Fruit wine martini after a guided tour of the winey. Reservations Required.